Discover together with Patrick van Rosendaal the life, preferences and habits of 24 colourful New Yorkers. They happily share their experiences and give you a unique look, from a different perspective, on life in the city. What are their favourite places to enjoy art, culture or tasty food? Where do they go for some peace and quiet, or to have a good time? Which bars do they frequent, and where should you go for the best cup of coffee? Which museums are trendy, and which galleries are up and coming? Where can you find the best deals, and which shops are absolute musts? Patrick's stories, knowledge and tips are the ultimate preparation for your adventure in The Big Apple. Patrick van Rosendaal followed his heart to the United States seven years ago, and quickly lost his heart to New York. His admiration for the city grew into a real passion. The urge to share his passion drove him into a life as a city guide. As an official member of GANYC, the prestigious professional association for city guides, he has already worn out three Vespas and an immeasurable number of soles during the thousands of kilometres he has covered while exploring the city. His own city guide company Be New York is becoming increasingly successful. Patrick and his team have given more than ten thousand visitors an unforgettable experience. After all his journeys through the city, Patrick wrote this book on the basis of various portraits of New Yorkers who crossed his path. 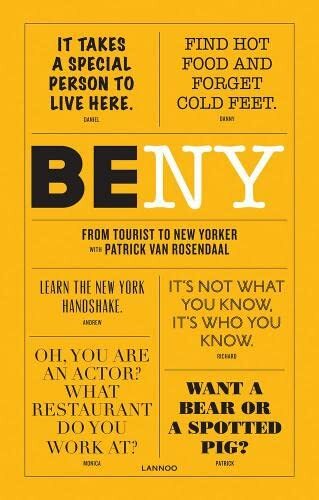 Interesting, creative, outspoken, or distinctive personalities who uncover the ins and outs of life in New York.